They say Delhi is going to dogs. Everyone spits, everyone eve-teases, everyone blow horns. The old monuments are disfigured; the new buildings lack aesthetics. 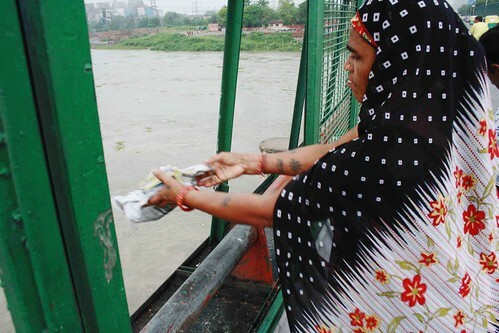 The Yamuna, the river that gives water to the Capital, is no better than a filthy nallah. Its water is black; its fishes are toxic. The consensus is that we are like this only. We are not like this only. 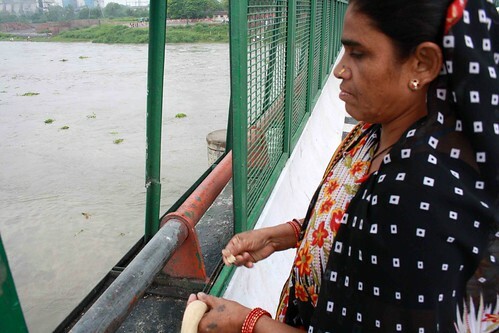 One rainy morning, The Delhi Walla spotted a middle-aged couple on the Yamuna Bridge, the one that connects Lakshmi Nagar to ITO crossing. It was drizzling; the man and the woman had no umbrella, no raincoat. The lady’s sari was wet. Standing by the side of the bridge, she threw a fresh-looking rose into the river. The flower quickly swimmed away towards the direction of Okhla. Because of the rains, there was more water in Yamuna; its usual sluggishness had given way to a fast current. The lady then cupped her palms into a namaste, closed her eyes and murmured what appeared to be some prayer. Meanwhile her man fiddled with a cloth bag before taking out freshly kneaded atta dough. He mashed some of the dough in his fist before passing it over to the lady. She made small balls out of it and started throwing them into the river, one by one. Both were silent. Then I interfered. “This is food for the fishes,” the lady said. “They should not go hungry.” The couple would not tell me their names or address but they confessed to come here daily, come rain or drought. 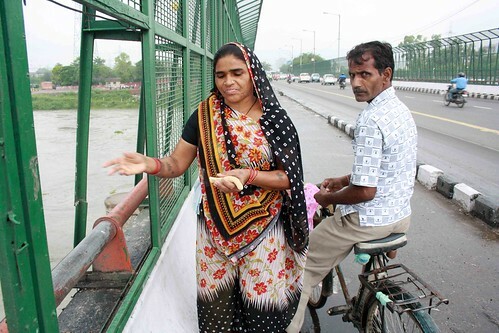 They said they live Yamuna-paar and peddle on their bicycle to reach this spot. Not wishing to further intrude into their private communion with the river and with the beings that live in it, I left the scene with a renewed belief in this city. Some Delhiwallas do care. Can you go? Why not? Go either to Lakshmi Nagar bridge or Nizamuddin Bridge to feed the fishes. They both have a special pavement for walkers. Go before 8am to avoid the rush hour traffic. If possible, take a bike. If each of us decide to change ourselves a little bit (Like I took a vow 6 months back that I won’t honk unnecessarily on road), Delhi or any city would be such a wonderful place! these are real Dilli walahs nd DIL WALLAHS too nd Dilli bhi inki wajah se hi hai. Aren’t these balls of Atta polluting the water? Hence,affecting the fishes. Dilli Nallahs (including Yamuna) as well as the Dilli wallahs should change for good..we only scorn at the dirt floating in Yamuna but never care to improve it…nice to know someone apart from the annual ritual of celebs and netas do actually care.. Sum ppl tke holi dip in this sum pollute it…..all in name of god….